While a rural Australian town may be the first to ban the sale of bottled water, whichever side of the great bottled water debate you fall on, there is an undeniable fact about drinking bottled water when traveling in developing countries: your empty bottles are almost certainly not being recycled, and instead destroying the beauty of the very country you traveled thousands of miles to see. I once bought some bananas from a street-side fruit vendor in India and decided to eat one right away. Just near the fruit vendor stood one of India’s many (estimated at 200 million) roaming cows. After finishing my banana, I held the remaining peel out for the cow, which promptly devoured it, and in that moment I realized how that banana had been a perfect zero-waste food: I got mine, the cow got hers, and nothing was left for the landfill. I can only imagine that India looked much cleaner years ago when the majority of garbage was either food waste or paper, both of which India’s many cows will happily digest. But with the introduction of plastic-packaged food products, suddenly there was waste with no consumer – and to make matters worse, most places in India have no municipal waste facility: no garbage truck that takes your bags of garbage away to a landfill where you’ll never see them again (something most of us take very much for granted). While glass bottles do get recycled in India (probably because of deposits), plastic bottles get thrown out with all the other trash – meaning they go on the side of the road, in the local stream, or to the heap of garbage just outside the village, which will eventually be burned to make room for the next pile of garbage. If you’re lucky, you might even see Indians burning the day’s collection of garbage at the beach. Foreigners look at them like they’re crazy (“Don’t you know that burning plastic creates toxic fumes?”) but they are simply dealing with the situation that they have to deal with: getting rid of the garbage (and often times it’s your garbage). While it’s possible (and quite preferable) to avoid buying pre-packaged foods in favor of eating at a local restaurant, water is one thing we can’t go without. Of course, if you’re in a developing country where one of the standard rules is “don’t drink the water,” how do you get around this problem of staying hydrated without leaving behind a huge pile of plastic water bottles? Technology to the rescue: a small, wand-like device called the SteriPEN promises “safe drinking water anywhere” by using ultraviolet light to sterilize water from lakes, streams and questionable taps in developing countries. You simply insert the device into your water container and stir (or shake) for about 90 seconds. When used properly, the UV light kills “99.9999% of bacteria, 99.99% of viruses and 99.9% of protozoa (i.e. Giardia and Cryptosporidium).” It’s smaller than pump-based purification systems and a better solution for long-term stays than water purification tablets (which can also add a chemical taste to your water). I personally used the SteriPEN Classic almost every day for my 5 month journey through India, so I can attest that it works. My daily water purification ritual was to couple my SteriPEN to a Nalgene water bottle using the SteriPEN Prefilter and shake the bottle gently for the required 90 seconds, usually while enjoying the view from my room. If you don’t already have a wide-mouth Nalgene-type water bottle, you may want to get the System Pack which includes the SteriPEN Classic, the Prefilter and a 32 ounce water bottle. If you want the most portable version of the SteriPEN, there is the SteriPEN Adventurer and the SteriPEN Traveler which are half the size and weight of the Classic (3.4 ounces vs. 8 ounces). However, the shape of these models (they only differ in color) doesn’t allow them to work with the Prefilter, which means you’ll have to stir your water rather than shake it. This may be fine if you’re only spending a week abroad, but for the long-term, I think the “shake” method is far less tedious than having to sit and stir water every day. 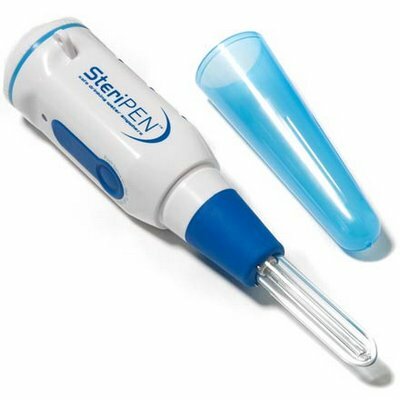 Fortunately there’s now a new, middle-ground option called the SteriPEN Journey which will work with the Prefilter, but is smaller and lighter than the Classic. It also features the addition of an LCD screen which tells you which dose you’ve selected (.5 liter / 16 ounces or 1 liter / 32 ounces), the battery status and the time remaining during a purification treatment. The Classic runs on four AA batteries, which should either be rechargeable NiMH batteries or lithium AA batteries (regular AA alkaline batteries are not recommended). I recommend using high quality rechargeable NiMH batteries such as Sanyo Eneloops, as I’ve had experience with my SteriPEN not working due to a low battery error with old and lesser quality rechargeable batteries even after they’ve been freshly charged. Using either rechargeable or disposable lithium batteries should get you about 200 purification treatments of 16 ounces of water, or 100 treatments of 32 ounces. The other versions of SteriPEN, including the Adventurer, Traveler and Journey, all use two CR123 lithium batteries , which are smaller and more powerful than AA batteries, though also more expensive. These models will get you about 100 treatments of 16 ounces or 50 treatments of 32 ounces per set of batteries. Note: lithium batteries must be disposed of properly, so if your lithium batteries die on you while traveling, please take them home with you to ensure proper disposal rather than throwing them out in a developing country, where they could end up somewhere that would contaminate the local groundwater. Keep in mind that using the SteriPEN or any water purification device does not guarantee that you won’t get sick while traveling. If you’re staying in an area where the water is questionable, there’s a good chance that you’ll be exposed to something through the food you eat (an inevitability that comes with traveling to exotic places). If you do get sick, I speak from experience in saying that you may find the SteriPEN to be your holy savior, as even if it’s the middle of the night, all you have to do to get drinkable water is turn the tap, fill the bottle and shake for 90 seconds.